The U.S. and China are the world’s top superpowers. 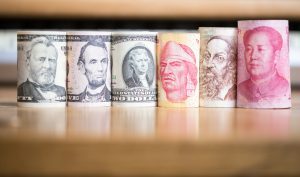 The outcome of recent trade negotiations may also impact the value of each nation’s currency. photo credit: Shutterstock. Thomas Freidman recently wrote a piece for The New York Times with a new take on the US-China trade and tariff war that you may not hear from other news sources chasing eye-catching headlines. Though on the surface, the arrival of America’s top-level trade negotiators in Beijing might imply attempts to avoid a trade war, Friedman says it’s anything but. Friedman goes on to give some historical context to demonstrate how we got here. After the Soviet Union fell, China moved toward capitalism. Though this had much to do with hard work from the populace, it also was because China’s government played the system, bending the rules set in place by the World Trade Organization, and sometimes breaking them through industrial espionage and intellectual property theft. 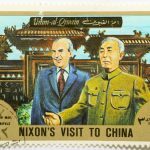 In 1971, President Nixon made history by flying to China for a week of talks, beginning a long process of reestablishing diplomatic relations between the two countries. At the time, the U.S. and China were bitter rivals; US and Chinese troops fought one another in Korea in the early 1950s, and China was aligned with North Vietnam and other communist powers. Nixon’s move was shrewd, surprising, and dramatic, and it achieved several goals at once. It represented a move toward ending the Vietnam War, served to provide the U.S. leverage in its dealings with the Soviet Union, and opened up options for trade between the two countries. In addition, the country has found other ways to play the system to its advantage. For example, China entered the WTO in 2001 and was allowed to do so as a “developing nation.” This permitted them to impose high tariffs on imports while at the same time enjoying low export tariffs. Though the assumption was that China would voluntarily readjust its tariff structure as the economy grew, it has instead refused to do so. In 2015, China announced a new “Made in China 2025” plan to dominate industries of the future that included robotics, self-driving cars, electric vehicles, artificial intelligence, biotech and aerospace. This came as a big wake-up call to the U.S. and Europe, who were more inclined to tolerate China’s rule breaking before the focus was on innovative new industries. And this is where the president’s tactics could make or break the future of U.S. economics. Though it’s clear that our president is taking the threat China poses seriously, taking an isolationist approach could prompt other world powers to align with China instead of the U.S.
Freidman’s argument is an interesting take on the trade conflict, and it helps shine a light on what this conflict might mean for our country’s economic future. Can the US and Europe make China play by the rules, or is it already too late to stop the Chinese trade juggernaut?